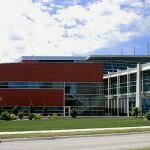 Howe Hall is home to the Department of Aerospace Engineering and Engineering Distance Education. The 163,000-square-foot building is equipped with a broad range of state-of-the art teaching and research facilities—from interdisciplinary design labs and an environmental and aerodynamic wind tunnel to high-tech classrooms and lecture halls with multi-media and distance education capabilities. The building also has offices for more than 300 faculty and staff. The large atrium in Howe Hall features C6, a next-generation virtual reality room that is one of the most advanced synthetic environments in the world. Howe Hall constitutes Phase I of a $61 million Engineering Teaching and Research Complex (ETRC) for the engineering college. The complex, which is the largest capital project ever undertaken by Iowa State, is funded by the state of Iowa ($33 million) and non-state sources ($28 million). Completed in 1999, the building was dedicated in honor of Helen and Stanley Howe. Mr. Howe, chairman emeritus and a board member of HON INDUSTRIES, is a 1946 Iowa State engineering graduate. The Howes presented a $6 million gift to the college in 1996, which helped begin the ETRC construction.